In 2012 test pits and a trial trench were excavated on the north-western side of the registered battlefield. This was centred on Field 19, but also extended north into Field 12, and east into Field 15. Further reason for investigation was provided by the discovery of two lead composite cannonballs during metal-detecting by Glenn Foard and team in 2007, on the eastern edge of the field, and an object initially said to be a royal livery badge (subsequently identified as part of a later 17thearly 18th century bridle-boss) which was found during fieldwalking in 2011. The test pitting exercise was to ‘test whether it was possible to locate the battle line’. Thirty-two test pits were excavated: Twenty three in Field 19, six in Field 12 and three in Field 15. 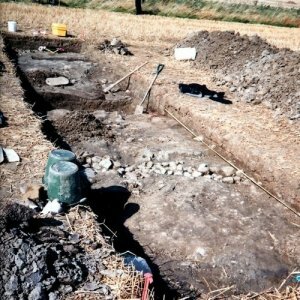 A trench (Trench 1) was also excavated in Field 19 as close to the northern boundary as was allowed by the derogation order. At the time of the archaeological investigations, farm drainage works were also carried out in an area adjacent to the track leading to Branxton Steads and Branxton Hill Farm. These were monitored by volunteers, and a significant depth of overburden was noted. It was rumoured that a quantity of soil had been imported and spread on the field (it has so far proved impossible to verify this). Some of the survey data was not available and as a consequence a number of the test-pits could not be accurately positioned on the plan. No body pit or human bone was found. Field drains of the ‘rumbler’ type (i.e. filled with stones) were found in Trench 1 with one running north/south joined by another running east/west (right). Two other possible drains were also recorded. Other linears were perhaps deep plough grooves. The presence of waterlogged wood is indicative of marshy ground with scrubby vegetation. Field drains were also found in a few of the test pits. There was evidence, pieces of chipped flint, chert and quartz, in rather more for prehistoric activity. A sample from one was sent for C14 dating and produced a date of 2143 -1972BC (right). Apart from the chipped stone mentioned above, a piece of degraded possible prehistoric pottery, a fragment of medieval pottery (from Trench 1) and a piece of Cistercian type ware (16th century) all other finds were later post-medieval (i.e.18th century onwards). Nothing which could be related to the battle of Flodden was found. The lack of evidence for a burial pit need not be conclusive as when Trench 1 and TP 32 (the closest to the drainage ditch) were plotted according to the available survey data they appeared to be some 25m east of the Ordnance Survey location. This however, is open to question. The story is reprinted almost verbatim in Richardson’s Borderer’s Table Book (1846) giving the source as ‘Local Papers’. The original report cannot be traced in any of the principal newspapers of the time. ‘near the spot where such a number of bones were found about forty years ago by Mr. Rankin’. So a cannonball was not directly associated with the finding of the pit of human bones. The Rev. Jones produced his own map which marked the ‘pit of bones’. Although this is only a sketchplan the find-spot indicated is clearly a considerable distance south of the Branxton-Moneylaws road. An estate plan of 1823 calls Field 19 the ‘Horse Field’, not ‘Horse Close’. A field called ‘Horse Close’ appears on an 1848 estate plan of Branxton Buildings Estate (owned by Haggerston). Depending on how the field boundaries are counted this could be construed as lying four fields broadly ‘west’ of the vicarage. The field lies on the boundary of Haggerston’s estate with Collingwood’s. Confusion over which landowner had undertaken drainage operations along this boundary could easily have arisen, and it is possible that this field is the actual site of the bone pit. It was not part of the investigations and lies beyond the designated battlefield boundary. ‘oral tradition holds estate workers...encountered a pit filled with swords and skulls and that the pipe was re-routed around the pit to avoid disturbing it’ (Burgess 2013, 2). Initially five trenches were proposed to examine the possible burial pit and abandoned pipe trench. Results were disappointing and to accommodate the high turn-out of volunteer excavators three additional areas were opened, two of them (trenches 6 and 7) over the knoll in the south-west corner of the field, where aerial photographs showed the faint outline of a double-ditched rectilinear enclosure. A further two test pits were also excavated. None of the trenches revealed any evidence for either a mass grave or an abandoned water-pipe trench. The geophysical anomalies were apparently geological. Three of the trenches contained ceramic field drains. Several livestock burials were found in Trench 6. These are probably connected to Branxton Buildings, the abandoned farm steading just south of the field. A number of pieces of chipped stone were recovered including two flint scrapers and a chert core. Such evidence for prehistoric activity has been found in almost all the fields walked and all the excavations. The only possible prehistoric feature in Field 15 was a pit or post-hole in Trench 1. It contained a possible hammerstone and a whetstone. A sample taken from the charcoal-rich fill was not considered viable for dating. The points at which the water-pipe crosses the hedge-lines are marked by posts (with impressed ‘W’) so its course as laid across Fields 15, 7 and 22 can be plotted. The 1912 account does not mention any re-routing to avoid the bones and its wording implies that the find-spot was in fact in Field 7, and broadly between the Monument and the Vicarage. This appears to be equatable with HER ID 752 ‘Possible mass grave, Battle of Flodden’, though it is described in the HER as the site of two pits, and the date is given as 1910, perhaps arising from confusion with the 1810 discovery. The published report on the ‘Two Men in a Trench’ excavations in Field 7 in 2001 states that ‘at one point we narrowly missed breaking a waterpipe with the JCB bucket’ (Pollard and Oliver, 164). Their trenches were south-east of the Monument although unfortunately there is no exact location for the ‘near miss’. However, it seems probable that this was the 1912 Pallinsburn pipe. The ‘Two men’ also refer to sheep skeletons being found (ibid, 165) in Field 7. It is impossible to be certain that the bones found in 1912 were in fact human. There may have been an initial misidentification, and the apparent lack of the further investigations (mentioned in the Antiquary as being proposed in the autumn) or any other record was to avoid embarrassment! If the bones were human, and if the later oral tradition of ‘swords’ being found with the skulls is discounted (it seems highly unlikely re-usable weapons would have been buried with the dead), the remains need not be related to the battle. The high ground now called ‘Piper’s Hill’ may have been a manorial gallows site and the bones those of medieval criminals, or even from a prehistoric cist disturbed by ploughing. It is worth noting here that the name ‘Piper’s Hill’ derives from a statement in Stow’s Annales (1580) that James IV was killed ‘at Bramstone upon Piperd hill’’. Stow is the only source for this. The hill is marked on the 1823 estate plan as Stock Law, and when questioned about ‘Piper’s Hill’ in 1858 the 70-year old churchwarden (Robert Rankin) said he had never heard of it! The name was first applied to Stock Law by Rev. Jones in the1860s as aspirations for a battlefield monument grew. He may also have been influenced by the fact that the field belonged to a sympathetic landowner John Collingwood, and was close to his church. It had become established fact by the 1900s when the existing memorial was erected (1910).